Psaledas is in his third term as an assistant coach for the Lancers. In 2014, Psaledas became the defensive line and assistant head coach for Coach Lauzon. He has been around the game of football for over 50 years. 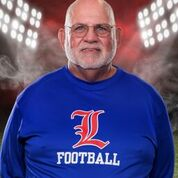 He coached under Coach Tom Sawyer at Londonderry from 1985-1988 and then again from 1995-2001. He was the head coach at Manchester Memorial High School from 1989-1994. He succeeded as a player at Manchester Memorial, receiving a full football scholarship where he played all four years at the University of New Hampshire. Psaledas has had the pleasure of watching his sons' and now second grandson play for the Lancers. He has also contributed to the betterment of Londonderry as the Assistant Principal at LHS and Town Recreation Director.